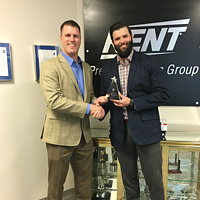 Kent Precision Foods Group (KPFG) is humbled to accept the Dot Foods Quality & Service Award for the seventh year in a row! Only 22 out of Dot’s 850+ manufacturer partners achieved this award – and KPFG is one of them! KPFG’s commitment to providing best in class service and communication has shaped opportunities to partner with the nation’s best food industry companies, such as Dot Foods, to service our mutual customers at an extremely high level. Dot Foods began its Quality & Service Awards program in 1998 to recognize manufacturers who provide exceptional customer service, support, and communication. Recipients are monitored monthly on a number of criteria regarding inbound service levels, electronic data interchange implementation and loading efficiency.